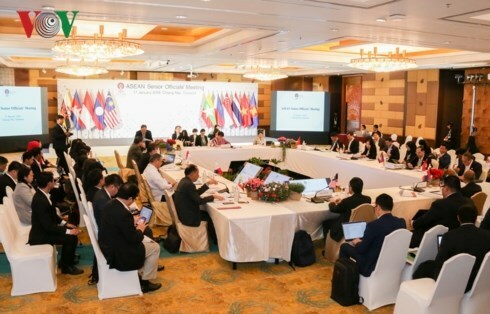 The ASEAN Senior Officials’ Meeting (SOM ASEAN) took place in Chiang Mai, Thailand, on January 16-17. The meeting was designed to review preparations for the two-day ASEAN Foreign Ministers' Retreat (AMM Retreat), which began on January 17. At the event, officials reviewed the association’s activities with partners this year, including the organisation of a commemorative summit between ASEAN and the Republic of Korea (RoK), which is scheduled to take place in the RoK in late 2019. They agreed to maintain ASEAN’s central role, while ensuring the bloc’s regulations and procedures in relations with its partners. The officials also discussed the constructions of a code of conduct for recently-proposed regional cooperative strategies and initiatives. Thailand takes over the ASEAN Chair this year with the theme “Advancing Partnership for Sustainability”, and the AMM Retreat in Chiang Mai is the first scheduled meeting for the ASEAN member countries. The foreign ministers are set to discuss issues which include initiatives to move the ASEAN Community agenda forward. They will also exchange views on regional and international issues of common concern as well as discuss the means to enhance ASEAN relations with its dialogue partners. The ASEAN foreign ministers are set to attend a working dinner on January 17.